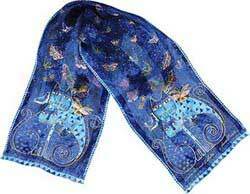 Indigo Cats Silk Scarf with Sequins by Laurel Burch. Between the blue of the day and the black of the night, lies the calming color of indigo as shown in this Indigo Cats scarf. This is a silk scarf with original artwork authentically created by Laurel Burch. Unbelievably soft, high quality silk and vivid, colorful Lauren Burch design makes this a perfect gift. Laurel Burch scarves have hand-rolled hems; this one is finished with sequins. Silk scarf is approximately 53" long by 11" wide.